This was my column in the SC United Methodist Advocate for April. Alexander Coke Smith is another of South Carolina Methodism’s contributions to the episcopacy. Born in Lynchburg, SC, Coke Smith enrolled at Wofford in 1868 and graduated in 1872. His father was a Methodist minister, so he grew up in parsonages around the state. Following his graduation from Wofford, he joined the South Carolina Conference, and was sent to his first appointment, Cheraw Station. After but a year there, he went to Columbia to serve at Washington Street, where he remained three years. He was the junior preacher in his first and the pastor in charge the second and third years – at the ripe old age of 26. Next, he went to Greenville Station – Buncombe Street – in 1876, serving for 4 years. Continuing his journeys around the state, the young minister went to serve Trinity, Charleston for three years, from 1880-82, where he became close to Bishop William M. Wightman in his last years. 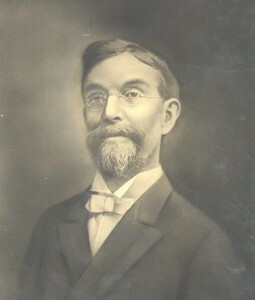 Smith then spent four years, 1883-86, as the Presiding Elder of the Columbia District, and following that, was elected to the professorship of mental and moral philosophy at Wofford. He followed in the footsteps of William Wallace Duncan, who had just been elected a bishop. That chair on the Wofford faculty actually produced three bishops, Duncan, Smith, and Smith’s successor, John C. Kilgo. Additionally, that faculty position was responsible for fundraising, so it gave Smith the opportunity to travel around South Carolina, representing Wofford, preaching in various pulpits, and making stronger personal connections. Though a young man, Smith sometimes suffered under the strain of his workload. Wofford historian David Duncan Wallace noted that “he had just almost killed himself saving souls in one of the greatest revivals in the history of Charleston,” and proceeded to conclude the process by his labors for raising the college endowment. After 4 years at Wofford, he was elected to the 1890 General Conference delegation, heading the South Carolina delegation. He was just 41 years old. The General Conference elected him as one of their three missionary secretaries, but he only stayed in this position for a few months before he was asked to become professor of practical theology at Vanderbilt. He moved again in 1892, transferring his membership to the Virginia Conference and serving churches there until 1902. He came close to being elected a bishop in 1898, and finally, was elected to the episcopacy in 1902. Incidentally, his younger brother, an 1889 graduate, was Ellison D. Smith. Known as “Cotton Ed,” the younger Smith was elected to the US Senate in 1908, serving six terms. He died in December 1906 in Asheville, having served a relatively short tenure as a bishop. Collins Denny, himself later a bishop, noted that Smith was “a man of rare versatility and adaptability, and charmed every circle and community into which he entered. He was a past master in delicate humor, and this gift was his servant, never his master.” His Methodist education had served him well, for “he had read widely and well, and his tenacious memory gave him ready command of his resources.” Bishops often need a blend of skills, and from what his contemporaries wrote, A. Coke Smith brought a mix of political acumen, intelligence, and preaching ability to that office.